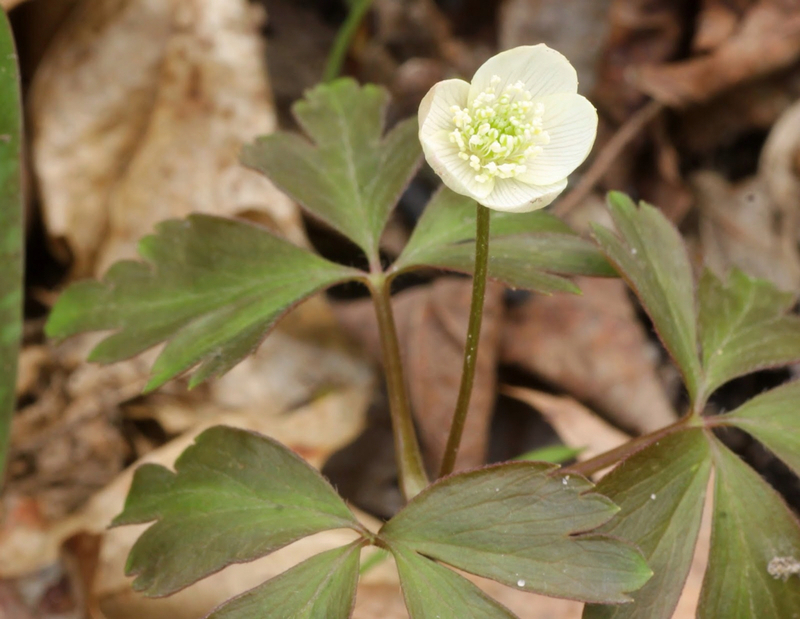 Wood Anemone, Rue Anemone, and False Rue Anemone. Three spring ephemerals, all in the Buttercup family, that are often confused with one another. Their similar appearance is made more confusing by their similar names; Names that contain familiar sounding words, but the meaning and how they apply to a flower isn't quite clear. So this post is more about the names then how to identify the plants. 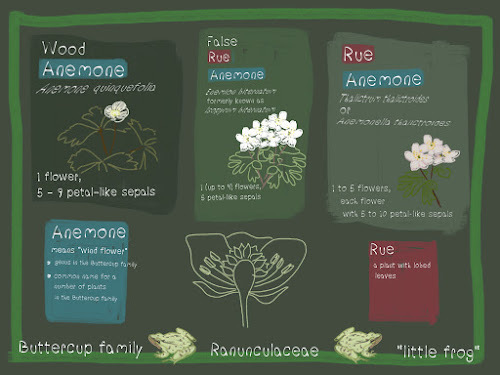 I think once you can stop wondering what a rue is, and whether it's false or not, or why the anemones moved out of the ocean, and into the woods, you can focus more on identifying the plants (you can always skip the identification part and just enjoy them too, but I can't help myself from putting names to things. Especially if it involves keys with lots of unfamiliar vocabulary). First, what is a rue. You can rue the day you started reading this blog of course. You can thicken a soup with a rue, but that's spelled "roux". The best song on Iron Maiden's second album is titled "Murders in the Rue Morgue" which in turn is named after an Edgar Alan Poe story of the same name, regarded as possibly the first detective story. But not of these uses of "rue" apply here. The name references another plant - Garden Rue, Ruta graveolens, a plant with a rich and long culinary, medicinal, and symbolic history. Instead of going into that history, I'll refer you to the book, A Modern Herbal a great resource available free online (because it's not actually modern at all with a publication date of 1931). Our rues probably derive their name from Garden Rue because both plants have similarly lobed leavese . The name "anemone" roughly translates as "wind flower" because the thin-stalked flowers often tremble in the breeze and has an old Greek origin. Like rue, the name anemone has been used for a long time, with the old world Wood Anemone, A. nemerosa being the original namesake. It is now used more generally as both a common name and genus name for various flowers in the Buttercup family that have a similar appearance. Sea Anemones are named after the flowers; their colorful tentacles resembles flower waving in the wind. So think of a Rue Anemone as a a plant with an anemone-like flowers and rue shaped leaves. And I'm guessing that False Rue Anemone was named after Rue Anemone and basically means "this plant looks a lot like Rue Anemone, so watch out". So we've covered the common names of these plants. Now on to the scientific names. Though the Latin and Greek origins of scientific names can be intimidating they can also be descriptive and helpful if you take a moment to do some common sense translating - or more confusing if the botanical identity of the plant has changed. Wood Anemone (pictured above) is in the genus Anemone which is pretty straight forward. The species name quinquefolia describes the five-lobed basal leaves; "quinque " refers to the number five just like quintuplets refers to five babies while "folia" refers to leaves as in the word foliage. Rue Anemone (above) is a bit more confusing (so skip this paragraph if you'd like). 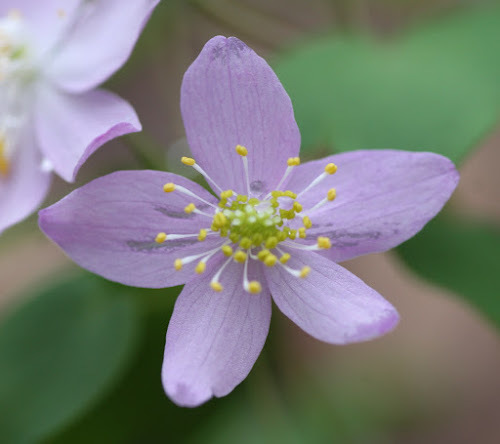 It is in one of two genera depending on the source, Anemonella or Thalictrum. Thalictrum is derived from an older greek plant name. Thalictrum thalictroides means "Meadow Rue-like Meadow Rue (I'll have to save the Meadow Rues for another post), which does't seem to make much sense. But it makes more sense if the genus Anemonella is used, because then it means "Meadow Rue-like Anemone flower". The rules of botanical nomenclature don't prioritze description but instead emphasize genetic relationships and historical precedent. The scientific name of False Rue Anemone (above) is currently Enemion biternatum. Enemion is also derived from another older Greek plant name. 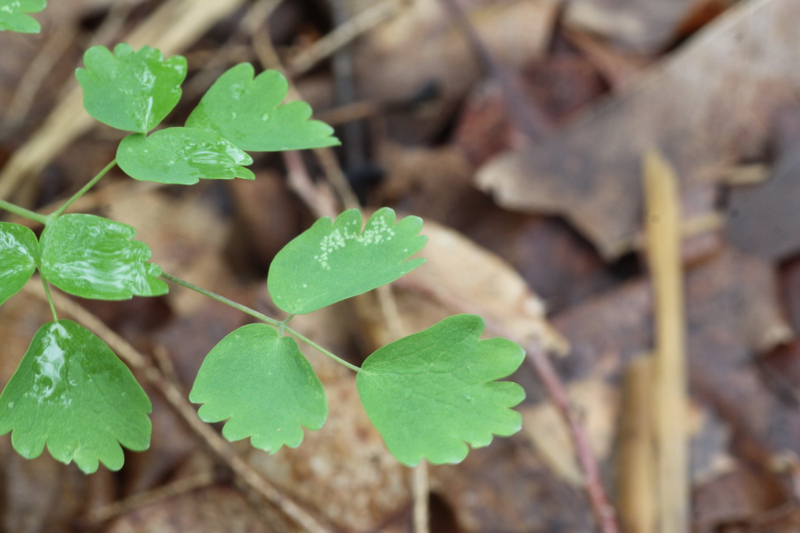 The species name biternatum means "twice in sets of three" and describes the leaf shape; each leaf is split into three leaflets and each leaflet has three lobes. You might find False Rue Anemeone called Isopyrum too. 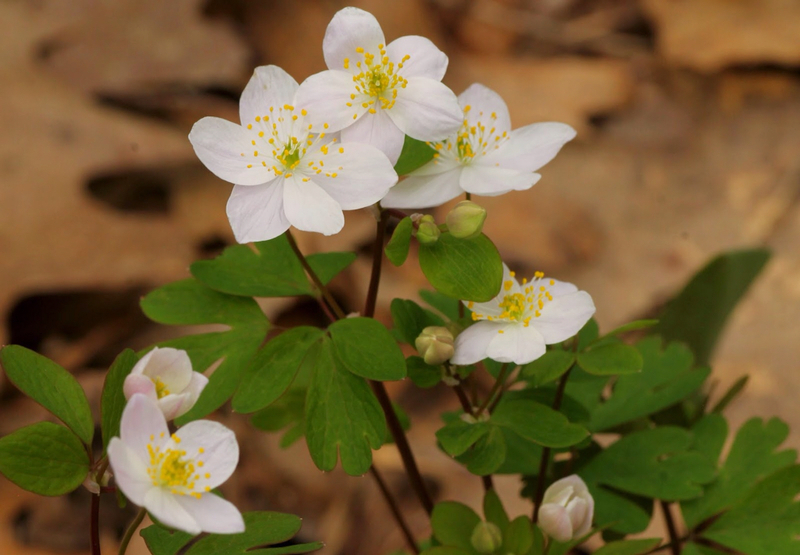 This was the old genus name for the plant, but since common names aren't bound to rules the way scientific names are, it's still perfectly fine to call False Rue Anemone by the name Isopyrum, you'll be showing off your old school botany creds if you do. Likewise, if you correct someone who calls the plant an Isopyrum and tell them that name is no longer current you'll be booted out of Smurf village like Brainy Smurf. I used information from the Friends of the Eloise Butler Wildflower Garden for this post. Check out their website, or better yet, visit the actual garden. It's one of my favorite places! I also used the online version of "A Modern Herbal" by Maude Grieves, as mentioned previously in the post. Though published in England and so not about plants found in Minnesota (where I'm found most of the time), it's still a great resource.